Congratulations everyone on the kill. The artifact nonsense might have made it slightly easier, but we were on pace to get the kill without the buff. We hit the 7.8% mark before, and that was with only about 10 people alive after chains 4. 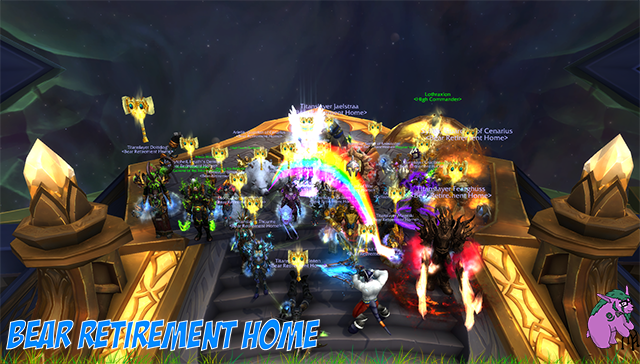 Our kill was the first time we made it past chains 4 with the raid still mostly intact. Job well done everyone. This boss was truly deserving as an end of expansion boss. In HFC, we used an addon to trivialize Archimonde's mechanic in the last phase. That was not the case for Argus, and so we struggled. After some nerfs here and buffs there, the fight became much more manageable because we were used to it. Enjoy some time off before BFA! Short weeks, achievements, and all the good stuff! P.S.My audio didn't go through, so I am gunna record the rekill and post it here. Listening to 10 minutes of silence as well kill Argus is mortifying, and I would rather not add music. CONGRATZ EVERYONE WHO MADE THIS KILL POSSIBLE! Last edited by Zernoxnun; 07-10-2018 at 02:08 PM.